A new recreation center has opened its doors in the neighborhood. Called Bury The Hatchet, the newcomer is located at 1719 Washington Ave. in Graduate Hospital. While this new spot promises to deliver a unique workout experience, it's not your typical gym. "You and your best mates will spend two hours becoming intimate with a 1.5 lb piece of whirling wood and metal as you learn, practice, and then finally square off toe-to-toe in a group tournament," a statement reads on the business' website. 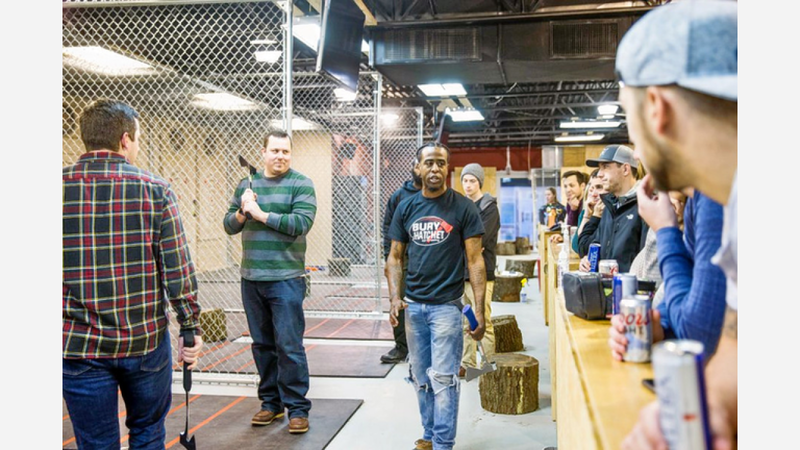 Bury The Hatchet brings the sport of hatchet throwing to the United States--a sport popularized in recent years in Canada--and already has another location on the way in King of Prussia, PA and other outposts in New Jersey and Georgia. Instructors will show customers how to throw hatchets, learn how to hit a bullseye, and participate in the sport safely. With just one review on Yelp thus far, Bury The Hatchet currently has a five-star rating. Dexter E., who was the first Yelper to review the new spot on January 20th, said: "Thoroughly enjoyed myself. This is definitely one of the greatest spots to hang with friends and jut loosen up in Philly. Reggie and Lew were our coaches and they both were outstanding guides." Intrigued? Stop in to try it for yourself. Bury The Hatchet is open weekdays from 5pm-11pm, and weekends from 10am-11pm.